Home Mobile Apps Technology Mozilla to Sale B2G Phones in Late 2012 | B2G to Compete with Androids? 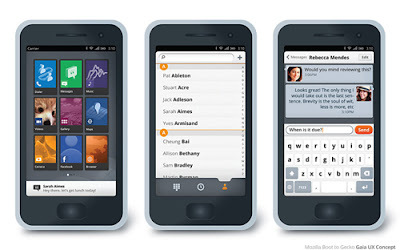 Mozilla to Sale B2G Phones in Late 2012 | B2G to Compete with Androids? According to BBC news site, the Mozilla’s Firefox web browser developers will sale mobile phones running an operating system called Boot-to-Gecko (B2G). B2G runs mobile apps like stand alone WebPages and able to share data and links says Gary Kovacs, Chief Executive of Mozilla in Sao Paulo’s mobile press conference. Though “gecko” sounds ugly, it was named after Firefox’s browser search engine called "gecko" (I see gecko14 on latest FF version).Preferably calling it B2G makes sense. Open apps with B2G is one of Firefox claims to bring over mobile users that allows to more control over what their phones do and the applications they run like what Androids does. The end product is expected to be lightweight, with low processing requirements. This will be useful in making devices which are cheap, even before carrier subsidies. If the B2G initiative is successful with good app developer support, smartphone like features can be provided on cheaper phones with the heavy duty work being done on the web. Off course, the device is design to run normal apps as well as casual games, but no details yet about how it would power highly graphical games or extensive apps. According to Mozilla’s blog post, Telefonica and Deutsche Telekom have given initial support to the initiative along with Adobe and Qualcomm for B2G’s deveopment. Telefonica's CEO Carlos Domingo in a CNET interview, claimed that B2G’s handsets will cost Ten times cheaper than iPhone. Deutsche Telekom joins the Boot to Gecko project with dedicated development resources, which will give a boost to the platform. On the other hand, Gaia planned to UI of Boot 2 Gecko IS. It is basically a collection of web apps integrated together to give a unified feel. The initial screenshots released by Josh Carpenter seem to be impressive. Mozilla has no plans currently to release its own Firefox phone. Firefox would not create the hardware but wants carrier partners to runs B2G on their devices which initially targets mobile and tablets. Mozilla expects that B2G becomes mainstream as developers will not jump to a platform where earning potential will be low. At the same time, apps developed for B2G will likely require minimum changes to be compatible with major mobile operating systems, and hence there will be no uniqueness to attract users. Critics claims that It will be a huge challenge for Mozilla to attract developers, carriers, handset manufacturers as well as users who are used to IOS, Android and Windows. It's still a long way off, but if Boot 2 Gecko really succeeds it could make its presence felt at the lower end phones, undercutting Android as well as Microsoft, which recently released its Tango update, causing problems for Nokia at the only market where it currently excels. There were no details yet on the date of release but Mozilla indicates aggressiveness to have it launch in late 2012 or on early 2013.